Nowadays, many suppliers sell the same or similar items. Therefore it's important to be sure to work with the right supplier (not only the cheapest). By providing this Drop Shipping Supplier Evaluation template, you can save time, cost and efforts and help you to increase the results that come out of your business immediately! This Rating system works with a weighting system, and will automatically calculate all the results in Excel. You will see that its intuitive, ready-to-use and logically structured. 1. Evaluate Supplier on items listed and check the appropriate columns, because some items may not apply. 2. Indicate Supplier’s overall rating by checking the appropriate column. 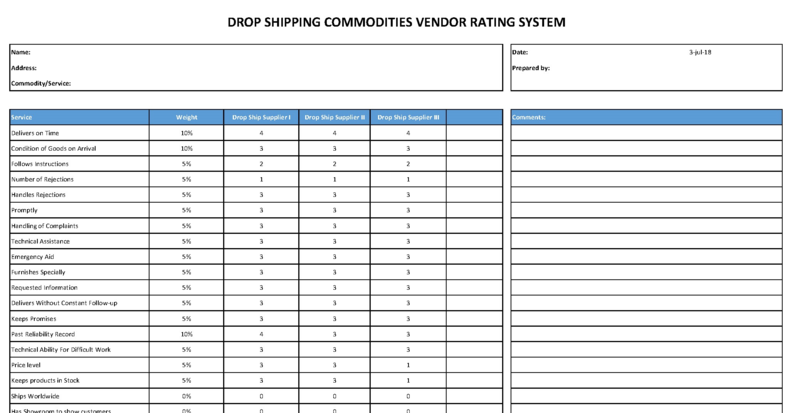 Download this Drop Shipping Supplier Rating Sheet With Weighting Excel template now and enhance your Drop Shipping business directly! In most situations, Customer is leading and his/hers wishes must be respected. These situations sooner or later will happen for sure!